How do You Select the Right Tomahawk? Choosing the right tomahawk is very important when you want to advance in learning how to throw a tomahawk. Sure you can just get an average hawk and throw it, but does it really suit you? Factors that you need to consider in getting a hawk are the brand as well as its proportion to your size and strength. What brand of Tomahawk is best for throwing? If you wanna check out some tomahawk offers, all of these throwing tomahawks are at the most competitive prices in the industry. Cold Steel makes the world's toughest and sharpest blades. The Frontier Hawk features American hickory handles and has an overall length of 22 inches and a blade length of 6 inches. The head is made from 1055 Carbon Drop Forged Steel and an overall weight of 21 oz. United Cutlery is well known for their tactical style axes and tomahawks. The M48 Tactical Tomahawk is the ultimate tactical and survival cutting tool. It has a lightweight design and a blade reinforced by a sturdy 30% fiberglass handle which contains three separate bolts for impact stability. SOG makes the neatest tactical tomahawks and axes. The SOG Fast Hawk has an overall length of 12.5 inches and a blade length of 2 inches. It has various uses such as throwing, chopping, digging, prying and notching. 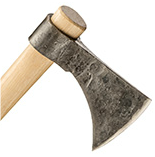 On an average, tomahawks range from 14 to 21 inches in length. It is important to know the concept behind the handle size. When the thrower is taller, the handle should also be longer. The handle size greatly affects the rotation speed of the hawk. The longer the handle, the slower the speed will be, and the farther you must be from your target. Familiarize yourself with the sport and learn more about tomahawks. Below is a guideline for tomahawk size to thrower size. There you go! With a little bit of research, you can now choose the right tomahawk that's perfect for you!